As You Are is committed to supporting adult survivors of sexual abuse, physical abuse, neglect, emotional abuse and domestic violence. 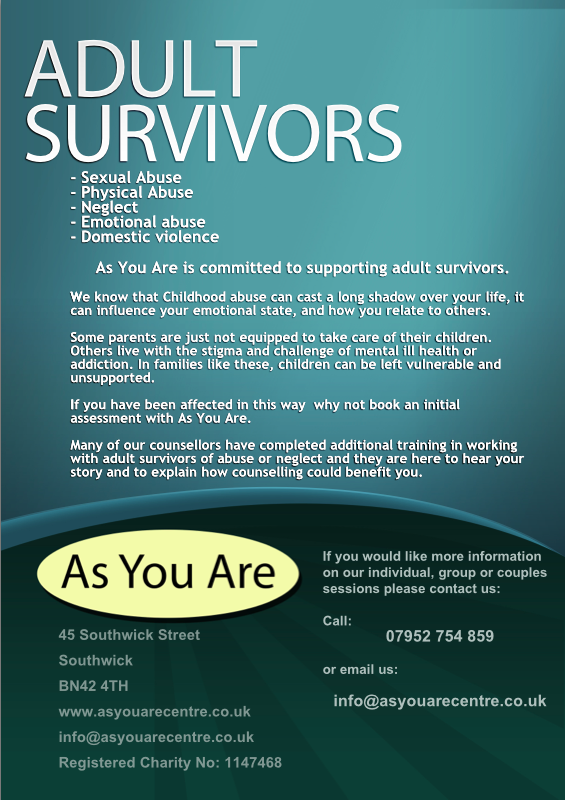 In offering an affordable counselling service in Southwick to those living in the immediate vicinity as well as further afield, including Worthing, Brighton and surrounding areas, As You Are understands that childhood abuse can cast a long shadow over your life, influencing your emotional state as well as your relationship with others. Some parents are just not equipped to take care of their children. Others live with the stigma and challenge of mental ill health or addiction. In families like these, children can be left vulnerable and unsupported. If you have been affected in this way, contact As You Are for an initial assessment. Many of our counsellors have completed additional training in working with adult survivors of abuse or neglect and they are here to hear your story and to explain how counselling could benefit you.